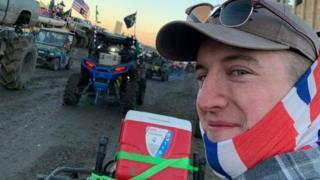 A memorial service has been held to mark the life of a British man who died after he crashed in an off-road rally in Texas. Steven Fairbairn, 25, from Newcastle, died in hospital after his 4x4 vehicle crashed at the Rednecks with Paychecks Spring Break event on 16 March. The service was at Holy Cross Church in the Fenham area of the city. Mourners were asked not to wear black as Mr Fairbairn was "a colourful character". Ahead of the service, Mr Fairbairn's mother, Lynne, said the service was "all about a celebration of Steven's life". She said: "We held his funeral and cremation out in America, but there were a lot of friends and family who wanted to offer their condolences. "It's important they got their chance to say goodbye." Asked what she missed most about her son, she replied "his smile, it was so endearing". An investigation into Mr Fairbairn's death is ongoing, but his mother branded the rally "irresponsible" and said she would like it stopped. Image caption Lynne Fairbairn said her son "touched so many hearts"
Steven's sister, Angela, said: "He was the best brother anyone could wish for. "We were close, always laughing and joking." Describing him as a "doting" uncle to her daughter, she added he had a "love for fast, adventurous stuff". A funeral for Mr Fairbairn was held on 23 March in Duncan, Oklahoma, where he moved 18 months ago. He had proposed to his American fiancée Abbey Green just two weeks before his death. Image caption Mr Fairbairn's partner, Abbey Green, said rally participants were asked to sign a waiver, which she described as "signing your life away"
The Rednecks with Paychecks event was attended by about 10,000 people, according to Chief Deputy Jack Lawson, of Montague County Sheriff's Office. Local media reported Mr Fairbairn had been driving a 4x4 which collided head-on with another all-terrain vehicle at the festival in Saint Jo, 75 miles north-west of Dallas. The Tarrant County medical examiner's office ruled his death was an accident due to "blunt head trauma".